For 113 years, the Rafu Shimpo newspaper has chronicled the story of the Japanese American community in Southern California. It survived World War II, when writers and editors were shipped off to internment camps. Before leaving, they hid the paper’s Japanese type under office floorboards. But if the money-losing paper doesn’t raise about $500,000 in revenue — by more than doubling its subscribers — it could close in December, marking the end of one of the last English-Japanese dailies in the U.S., and the oldest. Like many papers, the Rafu has struggled to adjust to the changing media landscape. However, those issues have been amplified by its small community, aging readership and the greater assimilation of younger Japanese Americans compared with other Asian American communities. The Rafu currently has a print circulation of about 7,800, down from a peak of 23,000 subscribers in the late 1980s. Its online subscriptions total about 800. Michael Komai, publisher of Rafu Shimpo. “It became more of a challenge for the Rafu Shimpo to be the hyperlocal community voice because the community dispersed, grew older, and unlike most of the other major Asian news media, was not replenished by increased immigration,” said Sandy Close, executive director of New America Media, a nationwide organization for ethnic media. “The digital revolution, combined with the recession, has, of course, been tremendously challenging for the ethnic media sector overall,” she said. The Rafu Shimpo — which means, literally, Los Angeles newspaper — got its start in 1903 as a mimeographed sheet put together by three USC students. In the early 1920s, H.T. Komai, the current publisher’s grandfather, took over the paper. He ushered in several changes, including the development of a new English-language section to appeal to a younger generation after immigration laws stymied the flow of new arrivals from Japan. As tensions built between Japan and the U.S., the paper ran editorials urging the Nisei — the second generation of Japanese in the United States — to show they were patriotic American citizens. The paper also proclaimed it was “100%” loyal to the U.S. But on Dec. 7, 1941, hours after Japanese planes attacked Pearl Harbor, Komai was arrested by the FBI along with other leaders from the community who were labeled “enemy aliens.” That left his eldest son, Akira, in charge of the paper’s welfare. Before Akira Komai was forced into a camp with other Japanese Americans along the West Coast, he hid the newspaper’s Japanese lead type in hopes that the Rafu could one day restart. On Jan. 1, 1946, the paper resumed publishing. Aug. 28, 1940: During the first day of registration under the Alien Registration Act of 1940, Toyosaku Komai, publisher of Rafu Shimpo, is fingerprinted by Gordon Green, right. Looking on is Frank Huber, left, assistant superintendent of mails at the Los Angeles Post Office. In the postwar era, Japanese Americans returned to L.A., especially Little Tokyo, and the neighborhood became a vibrant community, according to Lane Hirabayashi, a professor in the Asian American studies department at UCLA. In the late 1960s, legislation opened up further immigration from Japan. The community also began to spread throughout Southern California. Japanese Americans with higher incomes moved out, toward Gardena and the Westside, after civil rights legislation was passed outlawing housing discrimination. During this period, the Rafu battled for dominance in L.A. against another Japanese American daily, the Kashu Mainichi, and a few other publications. Nearly all have since vanished, and several of their writers, editors and columnists were absorbed into the Rafu’s staff. That included George “Horse” Yoshinaga, who penned the popular “Horse’s Mouth” column until his death this year at the age of 90. Ishino began writing her own column, “Maggie’s Meow,” in 2012. She continues to work at the Rafu and takes three buses to reach the office from her home in West Los Angeles. Today, there are only a few Japanese American publications left in the country. The Hawaii Hochi, founded in 1912, is believed to be the only other English-Japanese daily in the nation. The shrinking list of Japanese American publications contrasts with the dozens of publications geared toward the Chinese and Korean communities in L.A. and beyond. The disparity reflects shifting levels of immigration among those groups. In 2014, there were 274,000 ethnic Japanese in California, all but 103,000 of whom were native-born, according to the U.S. Census Bureau. This contrasts with the higher number of immigrants in the Chinese and Korean communities. There are 947,000 Chinese immigrants and 334,000 Korean immigrants statewide. 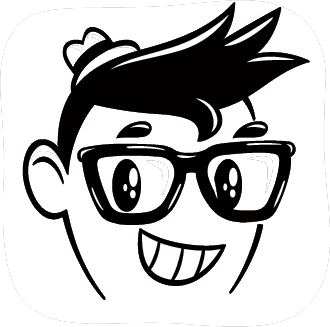 Like many print publications, the Rafu’s subscriber base is composed mostly of older readers. And like larger newspapers, the Rafu has been unable to make up for falling ad revenue. Last year, the Rafu pulled in $549,502 from advertising, an 8% dip from just two years ago. The paper has lost $750,000 over the last three years, and is expected to lose $350,000 this year. Editors said they plan to shift their coverage to appeal to younger readers and continue homing in on what makes their stories distinct from those of larger publications. Only the Rafu covers every single summer Obon festival, the annual Nisei Week celebration in Little Tokyo, and numerous community events from awards dinners to bazaars. When someone in the Japanese American community dies, the obituary will probably appear first — if not only — in the Rafu. Gwen Muranaka, English editor in chief of Rafu Shimpo. Some community members have called for the paper’s management to look for new sources of revenue. To reach a wider audience, the paper could include stories that appeal to readers interested in Japanese culture, or it could increase the Rafu’s digital presence, said Ellen Endo, former Rafu editor. The paper recently got an Instagram account and is getting increasingly active on Twitter and Facebook. 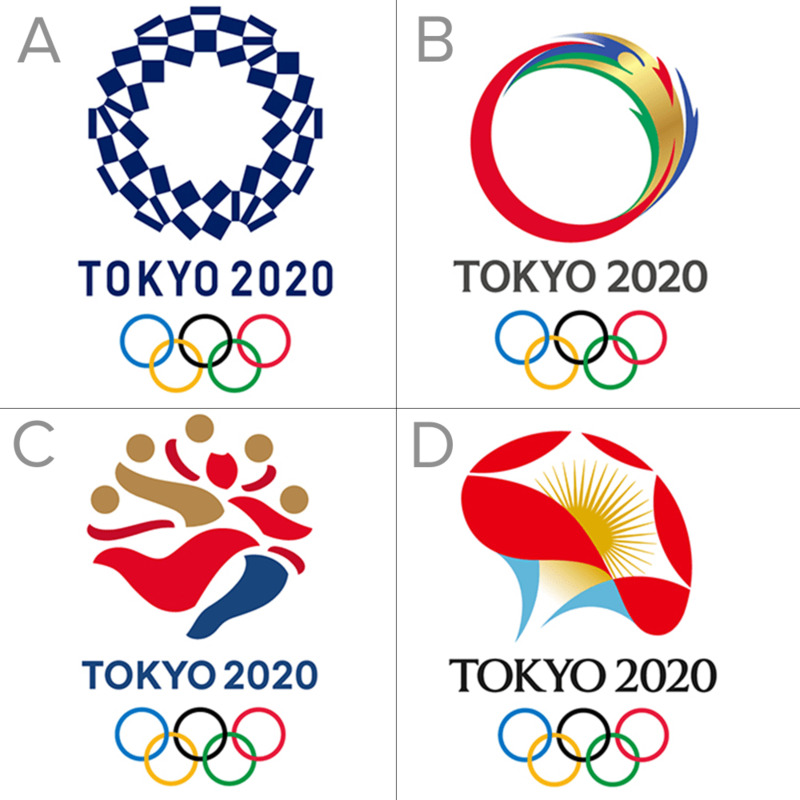 The new official emblem of the Tokyo 2020 Olympics was unveiled by organizers Monday, replacing an earlier design that was dropped after a complaint alleging plagiarism. The chosen checkered logo conveys “the message of unity in diversity,” officials announced. It was selected from a shortlist of four published earlier this month after a public contest that attracted 14,599 entries. The original, by art director Kenjiro Sano, was withdrawn last summer after Belgian artist Olivier Debie claimed that it echoed his work for the Theatre de Liege. Sano denied the allegation. The new indigo blue logo, called “Harmonized checkered emblem,” was created by artist and architecture graduate Asao Tokolo, 47. It “expresses a refined elegance and sophistication that exemplifies Japan,” Tokyo 2020 officials said in a statement. 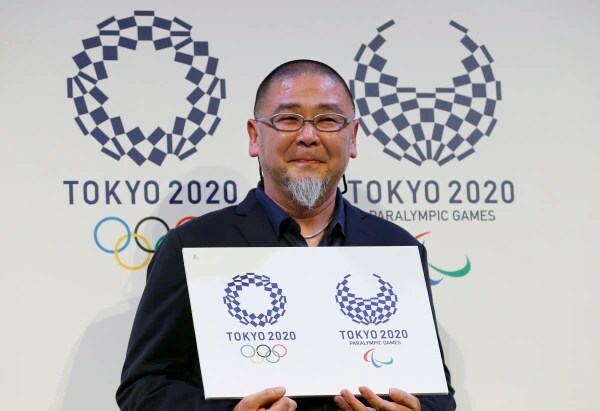 Designer Asao Tokolo holds his designs for the logo of the 2020 Tokyo Olympics, left, and the 2020 Tokyo Paralympic Games. The organizing committee for the Tokyo Summer Games has been plagued by fumbles. Last year, the original design for the main stadium was scrapped over mushrooming construction costs and public disapproval of the design, which had been likened to a bicycle helmet. The winning logo was selected from these four shortlisted emblems.